Seeing this remarkable event and hearing Andy Smith talk about his experience and practice gave this particular playwright much to consider. Don’t get me wrong: I love props and spectacle in theatre. There’s something quite magical and transporting about well-thought props and costumes. Also the way in which actors embody the characters we create and say the word we have written for them to speak. But even so, where does the ‘theatre’ actually take place? Andy Smith averred to an enthusiastic audience at Birkbeck’s Arts Week that it takes place in the audience. That the action, the drama, is not just unfolding in front of the audience, it is taking place inside them as well. To that end, the audience therefore (as I understand it) becomes part of the performance. This privileges audience experience and involvement of course, and makes the performance an exciting phenomenon, evolving before our very eyes, ears, minds and hearts, changing with each performance because the audience changes each time and therefore brings a different set of reactions, sensibilities, and willingness (or not) to participate. Andy Smith himself is open, warm and funny yet I felt that dematerialised theatre has the potential for psychodynamic effect in all its participants and therefore may not be for everyone. Of course, I could be wrong about this. Andy used a cooking analogy: dematerialised theatre is like a sauce reducing and reducing. The result may not be to everyone’s taste. One phrase certainly stuck with me. It’s not about ‘less is more’ but about doing ‘more with less’. Props and people become representational of objects. Is it any less authentic a ‘performance’ than Robert De Niro wearing underpants made by Al Capone’s underwear maker? Conversely, how does all this change the experience of the playwright, producers and actors of such a piece? Andy spoke of how plays might be performed by non-actors with scripts in hand and no prop above the size of a show; without the distractions of elaborate props, the attention is sharply focused on the action of the play and the feelings it engenders in the audience. I suppose a cinematic equivalent would be the ‘Dogme’ films where only natural light and sound is allowed. Or even the stage-like markings of Lars Von Trier’s Dogville and Manderlay, where the audience is compelled to imagine the sets. Andy demonstrated dematerialised theatre to the audience, who willingly participated in the impromptu ‘performance’ that started with the transformation of a glass of water into a tree and ended with an audience member transforming into Miss Julie. It seemed to this participant that it spoke to a very primal understanding of story. One that developed in our earliest days as hunter-gatherers when stories and drama were orally enacted and so our imaginations broadened exponentially as a result. It was utterly fascinating to witness and certainly gave me the urge to research the whole process further. Is caring in crisis? No, but NGOs aren’t helping. This article was written by Naveed Chaudhri, Head of Campaigns at Results UK. It was originally published on the Results UK blog. Last week I attended a book launch – not something I’ve ever done before, but this one seemed worth going to. “Caring in Crisis? 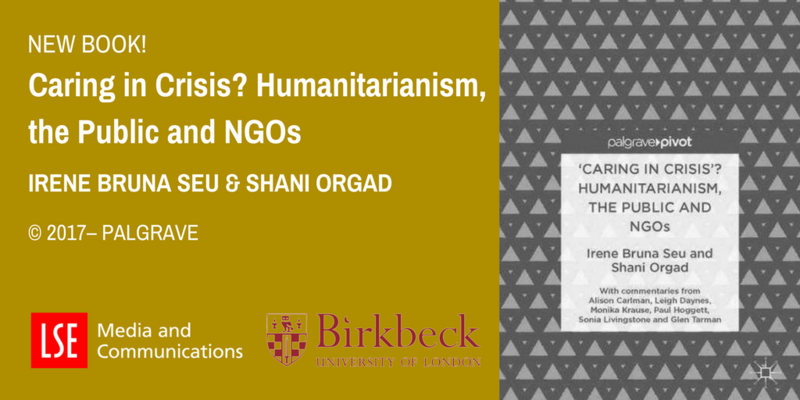 Humanitarianism, the Public and NGOs”, a new book by Irene Bruna Seu, Reader in the Department of Psychosocial Studies at Birkbeck, and Shani Orgad, Associate Professor in the Department of Media and Communications, LSE, was a title bound to get my attention. Speaking directly to my day job – helping grassroots supporters of international development share their passion with the public in order to make positive changes in the world – this was an event I had to go to. But with so much data already out there, and with so many reports on public engagement produced over the last few years, I wondered just what yet another set of speakers, another discussion, and another book could usefully add. A top-drawer panel – Kirsty McNeill from Save the Children, Nicola Peckett from the Disasters Emergencies Committee (DEC), Glen Tarman from Care International, and Paul Vanags from Oxfam, plus the book’s authors – strongly endorsed the view that the British public remains tremendously generous when disasters strike, and that human suffering touches us as deeply as ever. But beneath the surface, there’s a lot for NGOs to think about. Here are my top six takeaways from the discussions about how NGOs engage with the public in humanitarian crises and beyond. Despite what some people think, “compassion fatigue” isn’t reducing public support for humanitarian responses, which remains very strong. Some recent DEC appeals have exceeded expectations. Responding to complex, politically driven and, for most people, obscure crises, the East Africa and Yemen appeals gained widespread public support. Faced with stories of human misery and an immediate chance to help, “the heart wins, and people give”. Media attacks on international aid, especially prevalent this year, don’t seem to have damped charitable giving, but there is a “looming crisis of trust” which could hurt public support in the longer-term. NGOs must help the public engage positively to help those in need, and to feel good about their role and act together to counter negative narratives of wasted aid and insularity. 2. It’s all about the money…oh no it’s not! The challenge of finding meaningful ways to help others who are suffering in distant lands is a perennial one. On the one hand, NGOs would like the public to understand more about the causes of insecurity and suffering, and go beyond giving one-off donations; yet it’s perfectly reasonable for people to want to respond to an emotional appeal and then move on to deal with their own daily concerns, trusting NGOs to spend the money well. On the other hand, giving can be “an act of love” involving a lot of emotion, every bit as engaged as political activism, and sometimes more so (as clicktivism shows). Either way, there’s a need for NGOs to help people find appropriate ways (the metaphor of “journeys” crops up again and again) to engage a second and a third time, and learn more about the issues if they want to. Is giving money the only outlet for people’s empathy? No, but it mustn’t be looked down on. And of course there’s the critical issue of how ‘beneficiaries’ are depicted: there’s now solid evidence that showing distressing scenes of human misery can reduce people’s sense of agency and make them disconnect. The tactic may not even raise more money in the short term anyway. Back in 2005, the Make Poverty History campaign showed that you can build a big public movement and get real change if the politics are right. Collectively, we helped get $50 billion of debt written off, which fed into real gains for access to health and education in developing countries, and the lives of millions of people improved as a result. But it’s unlikely we’d want to replicate such a big brand-led movement today, as the world has moved on. Recent mobilisations channelling public concern have been far more organic; not leaderless or disorganised, but working perfectly well without a top-down structure. Successful movements allow people to do their own thing, based on a central idea or goal that fires their imagination, but doesn’t tell them what to do. Look at the way people came together around the Manchester terrorist attack, the Women’s Marches, Black Lives Matter, or the Refugees Welcome movement. Only in the latter have NGOs played any kind of a role, and it seems that we haven’t yet properly woken up to the reality of how people organise around causes today. While digital communications play a strong part in helping people connect with causes (especially social media, where there are no barriers to entry), traditional community organising is once more coming to the fore. The things people actually want to do – marching, demonstrating, celebrating, or whatever – happen in their local communities, in the company of like-minded people. The idea that you can get people to act online seems more and more like a marketing idea that doesn’t meet people’s emotional need to connect and act. Is the digital marketing chapter coming to a close? You’ve got to wonder. Humans care about each other – in their own lives, and also when exposed to distant communities in crisis. Emotionally and in reality, we see people reacting in similar ways in both cases. International NGOs are uniquely placed to connect people to the issues we work on, but we don’t tend to communicate in ways which aim primarily to connect people emotionally. We are still far too fond of demonstrating truths through statistics, rather than telling inspiring stories of hope and change. And forget ‘myth busting’ – it’s not helpful to show people they are wrong and then tell them what to think. We should instead tell people stories of their successes, holding up a mirror up to the public to show them where they have been powerful agents of progress. 6. So, what’s the plan? There’s a feeling that NGOs are faced with “a crisis of objectives, not of caring”. What should we be asking charity fundraisers and communicators to do? ‘Just’ raise money, or raise money and build long-public awareness and concern? This is a top level strategic question which needs answering very soon, at the most senior levels. The book’s authors spoke of “cognitive blocks to action”. NGOs have for years been giving out unreal and simplistic expectations of what overseas aid is and achieves – with the best of intentions – and have inadvertently reinforced notions of victimhood and dependency. How long can this carry on? Such fundraising practices may not yet be an immediate problem in terms of how much people give to charity, but in terms of movement building, we should definitely be concerned. Income is easy to measure, but the desire to engage isn’t. NGOs must find ways to do this. NGOs can be amazing connectors, inspiring people to be the best they can be, expressing our common humanity and making the world a better place. We are needed as much as ever, and few other actors in society can do this – but we do need to change ourselves. The next few years could be a very exciting era for the international development sector, and if a ‘Global Britain’ is going to mean anything substantial, NGOs have a big role to play. Check out this postcast about Caring in Crisis? with author Dr Bruna Seu, and Glen Tarman, Head of Global Advocacy at CARE International, who discuss some of the issues raised by the book (26min 8s). On Monday 5 June 2017, Professor Sarah Hart from Birkbeck’s Department of Economics, Mathematics and Statistics gave a prestigious Gresham Lecture at the Museum of London. Andrew Silverman, Learning Development Tutor in the School of Business, Economics and Informatics reports on the lecture. Gresham College was founded in 1597 and has been providing free lectures within the City of London for over 400 years. Walking down from the dusty roads of the Barbican into the cool and quiet of the Weston Theatre, the audience was transported into a conversation between an artist and a mathematician, Escher and Coxeter. Told with infectious excitement and humour, Professor Hart wove the story of the lives of these two figures and their friendship through the mathematics and the artwork that fed into one another. Born on 17 June 1898 in Leeuwarden, Holland, the youngest of five brothers and moving with his family to Arnhem when he was five, Maurits Cornelis Escher would eventually go on to study at the School for Architecture and Decorative Arts in Haarlem. His father was a civil engineer and his brothers all became scientists. Escher himself almost became an architect before switching to graphic arts. He later quipped that it was only by a hair’s breadth that he escaped becoming a useful member of society. Escher began by producing woodcuts and lithographs featuring mainly landscapes. An example of this was the 1931 lithograph Atranti, Coast of Amalfi. But in 1936 his work went in a new direction, becoming more abstract; according to Escher, he had replaced landscapes with mindscapes. The woodcut Metamorphosis I, produced in 1937, exemplifies this change and is clearly a ‘mindscape’ adapted from the 1931 piece. What could have triggered this change? In 1922, Escher visited the Alhambra palace in Granada, Spain; his second visit was in 1936. The buildings we know today were constructed in the mid-11th century by the Moorish king Mohammed ben Al-Ahmar. One of the key points about Moorish art, and Islamic art more generally, is that it is not permitted to contain images of living things; it is instead rich in symmetry and tessellations of tiles. Escher was able to combine this richness of geometric design with images of ‘living’ things (albeit at times mythical living things), thereby leading to works such as Angel and Devils (1941), produced in ink rather than wood. Donald Coxeter, or Harold Scott Macdonald Coxeter, was born on 9 February 1907. His name was originally going to be Harold Macdonald Scott Coxeter, until they realised that this would have been HMS Coxeter, more a ship name than a baby name, and so the name was changed. As a schoolboy, Coxeter became so engrossed in geometry, at the expense of other subjects, that one teacher told him he was only allowed to think in four dimensions on Sundays. In 1954, the International Congress of Mathematicians was held in Amsterdam. To coincide with this, a major exhibition of Escher’s work was held in the Stedelijk Museum in Amsterdam. It was here that Coxeter and Escher first met, when Coxeter bought a couple of Escher’s prints. Incidentally, another mathematician who visited the exhibition was Roger Penrose, who was a Reader and then Professor of Applied Mathematics at Birkbeck from 1964 to 1973, and later became Professor of Geometry at Gresham College, London. After seeing an impossible staircase in Escher’s Relativity print, he came up with the concept of a ‘Penrose triangle’. Professor Hart explained the mathematics behind the regular tilings in three geometries: plane (Euclidean), spherical and hyperbolic geometry. She managed to put the concepts across in such a way that even someone with no prior knowledge could walk away with a good basic understanding, and the images presented were an excellent way of getting a more intuitive sense of what was really going on. Escher learnt a great deal from Coxeter, to the extent that when Escher created a picture based on a new geometrical concept, he would refer to it as ‘Coxetering’. But in turn, Coxeter also learnt from Escher. For example, Escher’s 1959 work, Circle Limit III, led Coxeter to a new understanding of the hyperbolic disc. By looking at the spines of the fish in the image, Coxeter realised that Escher had found equidistant curves and produced them incredibly precisely. In this way their friendship was a true exchange of ideas – a mathematical conversation. On 8 June, Birkbeck’s Department of Psychosocial Studies in collaboration with the MaMSIE research network (Mapping Maternal Subjectivities, Identities and Ethics), and with support from Clinks, hosted practitioners and academics to consider the challenges that face mothers in UK prisons. PhD student Claire Horn reports on the event. It felt fitting that this discussion fell on the day of the election. In a time characterized by media amplification of partisan debate and the claims of our political leaders, this was an afternoon to consider the voices of women that often go unheard, and to reflect on an issue that requires collaboration across political divides. Opening the event, Lisa Baraitser (co-founder of MaMSIE, with Cambridge University’s Sigal Spigel), spoke of the importance of addressing the experiences of women who parent and are in prisons as a pressing feminist issue. Setting the tone for the discussion to come, she cited the need to reflect on what incarcerating mothers does to women, to children, and to communities. Anne Fox, Chief Executive Officer of Clinks, chaired both of the afternoon’s panels and facilitated a focused and thoughtful dialogue. Fox raised an issue in her opening remarks that was reflected again and again throughout the afternoon: as a society, we undervalue and fail to critically consider motherhood. Given this lack of attention to motherhood in general, mothers in prison are in an especially unique situation. In a culture that demonises those who have offended, they are already stigmatized. As mothers, that stigma is amplified. The first group of panelists delved into this double de-valuing of imprisoned mothers. Naomi Delap is the direct of Birth Companions, an organisation that provides physical and emotional support to pregnant women and mothers in UK prisons. Delap spoke of the lack of basic access to care for many pregnant women, and the necessity of codifying perinatal services and support. While Delap spoke of initiatives to de-carcerate pregnant women, and provide better community services she also illustrated the need for appropriate care for pregnant women who are currently imprisoned. The Birth Charter, compiled by Birth Companions, sets out specific and carefully considered recommendations. Laura Abbott, the second speaker of the day, is undertaking doctoral work in health research at the University of Hertfordshire on the experience of being a pregnant woman in prison. She is also a volunteer at Birth Companions, and she spoke of the vital importance of midwifery support for imprisoned pregnant mothers. Abbott shared her work on interviewing mothers and staff in prisons, and through her presentation, represented the voices of mothers who spoke of a lack of access to basic care, and also of their sense that sentencing mothers acts as a punishment to their children. Anastasia Chamberlen, Assistant Professor at the Department of Sociology at the University of Warwick (and past lecturer in Criminology at Birkbeck), discussed the gendered embodied experience of prison and punishment, noting the ways in which the impact of incarceration lingers in and on the body. Among other specifically gendered phenomena, she spoke of how for many women she interviewed, the period of imprisonment extended over what might otherwise have been mothering years. In the panel that followed, Lucy Baldwin, Senior Lecturer in Community and Criminal Justice at De Montfort University and editor of the Mothering Justice collection, spoke of the emotional impact of incarceration. Baldwin described prison as an assault on a mother’s ability to do the work of mothering. She gave the powerful example of prison visit rules that do not allow for mothers to touch or hold their children during visitation hours. As Baldwin so aptly noted, this lack of contact would be viewed as neglect outside prison walls, yet inside, it is enforced. Shona Minson, DPhil in Criminology at Oxford University, and author of the “Motherhood as Mitigation” report published by the Howard League for Penal Reform, spoke further of the impact of maternal imprisonment on children. She described the ways in which having a mother in prison is linked to risks to children, and explained the phenomenon of “secondary criminalisation,” through which children experience the punishment and stigma of their mother’s penal sentences. These five speakers forcefully articulated the potential impact on individual women, children, communities, and society more broadly when mothers are imprisoned. While these panelists are each engaged in the important work of addressing these issues, the concerns they raised also demonstrated the need for further support. Anne Fox closed out the event in a memorable way by asking the room (fully populated by researchers, students, activists, and practitioners) to consider questions for collaboration. Birkbeck is unique among universities in that many students and faculty are invested in producing research that bridges theory and practice. I am hopeful that this event will prompt further work in this vein, and that attendees will heed the call to communicate and collaborate.